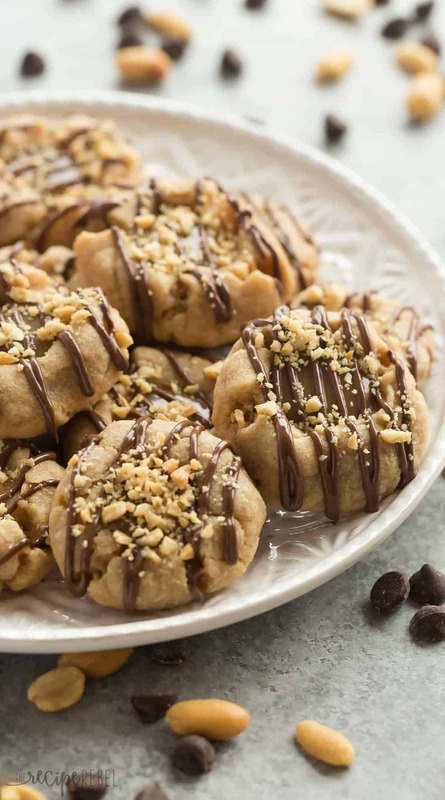 These Peanut Butter Turtle Thumbprint Cookies are a new twist on a classic Christmas cookie — with a peanut butter cookie base, a simple caramel filling, a drizzle of chocolate and a sprinkling of peanuts, they’re sure to be a new holiday tradition! Plus a recipe video. To be totally honest, I feel a little like I dropped the ball on the whole Christmas cookie thing this year. I’ve got a ton of holiday themed desserts — candies and pies and a danish and more pies — but not many cookies. And I don’t have a bunch of cookies coming your way in December (although I have one more coming your way in a few days that I snuck in at the last minute out of guilt — keep your eyes peeled!). Rest assured, I will be doing a whole lot of Christmas cookie baking in real life — I hope. 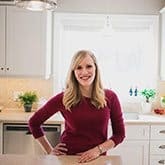 I’m planning to skim through some of my favorite old holiday cookbooks, try some recipes from my Grandma’s cookbook that I haven’t had a chance to try yet, and just enjoy getting the girls back in the kitchen with me without having to worry about meticulous recipe testing. But when the Peanut Bureau of Canada asked me to come up with a cookie swap-worthy peanut butter cookie, my mind immediately went “turtle”. That combination of nuts, caramel and chocolate is one I know you all love, and it’s one I love too! 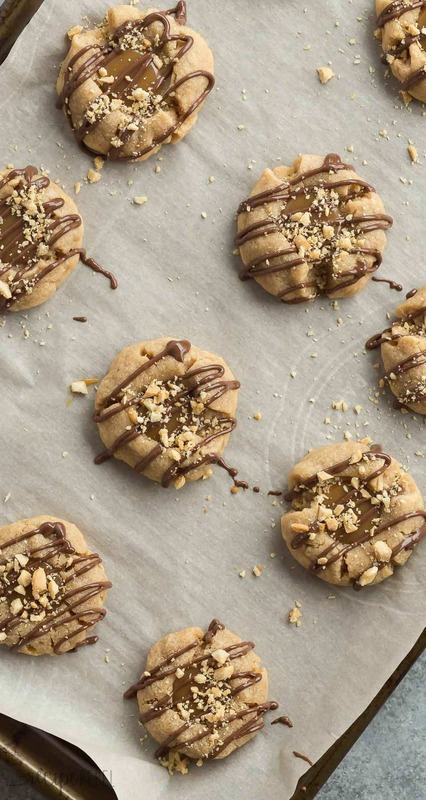 These Peanut Butter Turtle Thumbprint Cookies are taking things up a notch though, because they start with a peanut butter cookie base — I used the Classic Peanut Butter Cookies recipe from the Peanut Bureau’s web site. They have a super simple caramel filling, a chocolate drizzle and a sprinkling of chopped peanuts — I like to use salted, roasted peanuts for that crunchy, salty contrast to all the sweetness! I want to know: what’s your favorite Christmas cookie?!? For me? I love anything mint and chocolate, but these Thumbprint cookies are on my must-make list for years to come! These Peanut Butter Turtle Thumbprint Cookies are a new twist on a classic Christmas cookie -- with a peanut butter cookie base, a simple caramel filling, a drizzle of chocolate and a sprinkling of peanuts, they're sure to be a new holiday tradition! Preheat oven to 350 degrees F and line 3 baking sheets with parchment paper. Set aside. In a large bowl, combine peanut butter, butter, and sugars and beat with an electric mixer until smooth and creamy. Add flour, baking soda and salt and mix until combined -- you may have to do this with a spoon or your hands. Roll into 1" balls and place about 2" apart on baking sheets. Bake for 8-10 minutes (I bake mine for 9) until puffed and dry looking on top. After removing from the oven, use the back of a ½ teaspoon measuring spoon to make an indent in the center of each cookie. Set aside to cool completely. In a small pot, combine caramels and milk over low heat. Cook, stirring regularly, until melted and smooth. Spoon ½ teaspoon into the center of each cookie. In another small pot, heat 1" of water over medium heat until simmering. Place a glass bowl over top, ensuring that the bottom of the bowl does not touch the water (you are making a double boiler). Place chocolate in the glass bowl and heat, stirring constantly, until melted and smooth. Pour chocolate into a plastic bag and snip one of the corners. 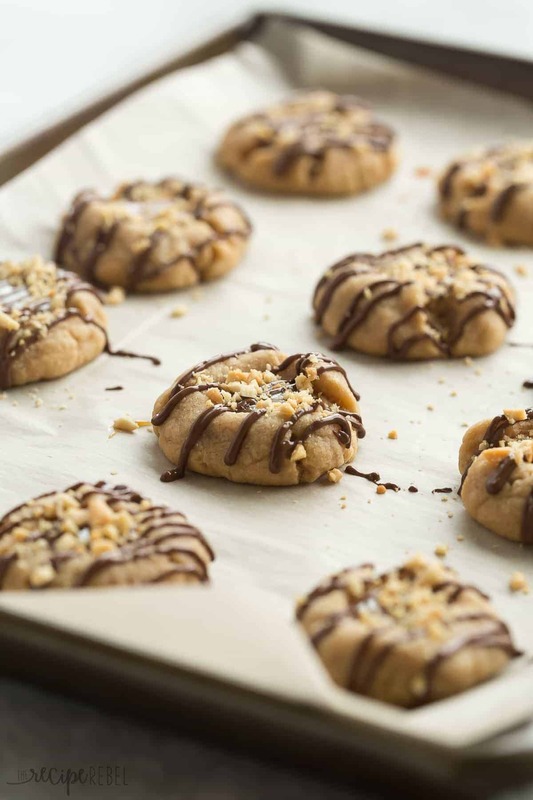 Drizzle chocolate over cookies and immediately sprinkle with chopped peanuts. Let set until chocolate is set before storing in an air tight container on the counter for 1 week or in the freezer for 3-4 months. 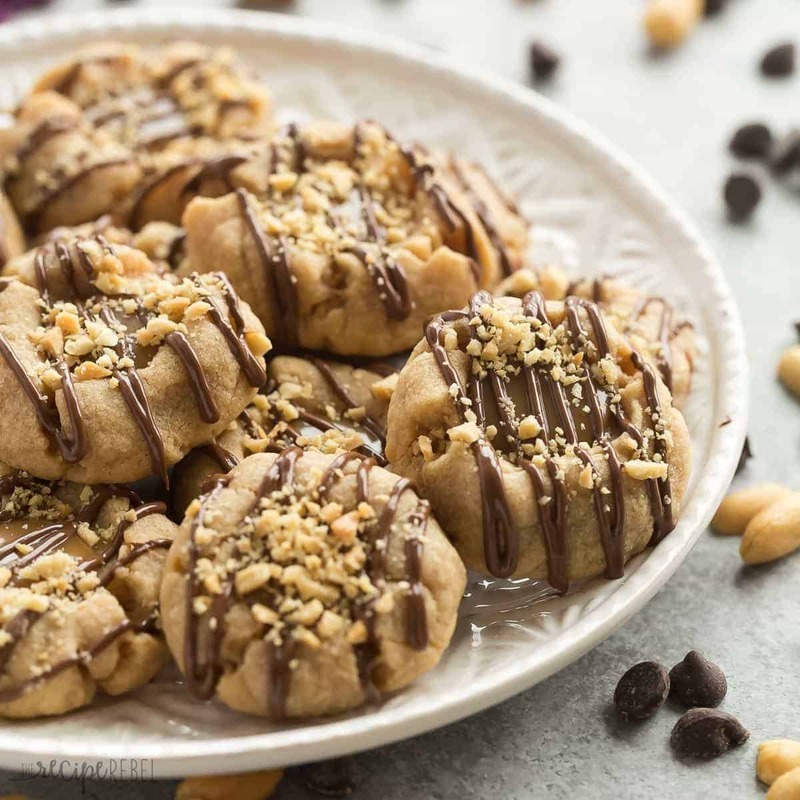 These Peanut Butter Turtle Thumbprint Cookies are a new twist on a classic Christmas cookie — with a peanut butter cookie base, a simple caramel filling, a drizzle of chocolate and a sprinkling of peanuts, they’re sure to be a new holiday tradition! Add flour, baking soda and salt and mix until combined — you may have to do this with a spoon or your hands. Roll into 1″ balls and place about 2″ apart on baking sheets. Bake for 8-10 minutes (I bake mine for 9) until puffed and dry looking on top. After removing from the oven, use the back of a 1/2 teaspoon measuring spoon to make an indent in the center of each cookie. Set aside to cool completely. In a small pot, combine caramels and milk over low heat. Cook, stirring regularly, until melted and smooth. Spoon 1/2 teaspoon into the center of each cookie. In another small pot, heat 1″ of water over medium heat until simmering. Place a glass bowl over top, ensuring that the bottom of the bowl does not touch the water (you are making a double boiler). Place chocolate in the glass bowl and heat, stirring constantly, until melted and smooth. Just made these and they turned out awesome! Perfect for the holidays and add a nice festive twist! Thank you! Thanks Alyssa! I’m so glad! Can’t wait to make these but was wondering….could the chocolate just be microwaved instead of using a double boiler? Thanks and Merry Christmas from Alberta!! oh, that makes sense! lol I will stick to the stove :-). Also, it says you can put the melted chocolate in a plastic bag. Can you use something like a plastic freezer bag or would the chocolate be too hot for that type? It should be fine! You can let it cool slightly if you’re worried it’ll be too hot. I’m a teacher stuck at home recovering from rotator cuff surgery. Despite having my dominant right arm in an unwieldy sling I have managed to bake up a storm in 3 weeks! I thought I was done until I spied these yummies on fb! I couldn’t manage the chocolate in a bag so I just drizzled with a fork. They look just as yummy! Oh, I also didn’t have caramels so I super-cheated and used Smuckers caramel sundae topping. Lol. Thanks for sharing this one. ? Wow that is quite an accomplishment! I’m so happy you like them! I included them in my new blog http://www.canadiansnowqueen.com with a link to your blog. 🙂 They’ve been a big hit with my friends and family. Happy New Year! 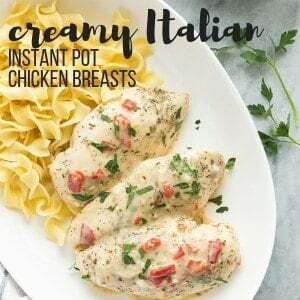 Thanks for these awesome recipes. I live in the midwest of America but lived in Canada for a year. Learned to cook there as we had so many blizzards & it was so frosty outside. It was nice to heat up the cabin with wonderful smells & keep warmer too! I’ve just mived to a different house with a much nicer kitchen. I am actually making out my shopping list looking at these ideas. It has become cold here now & it is holiday season…..no more reasons not to bake & cook good eats, eh? Can’t wait to taste these new delights. My passions are my dog and photography. And maybe now, I’ll get back to cooking & baking too. Hi Linda! Thank you for sharing that! It’s so funny you mention that because we are actually in the middle of a BIG blizzard in Manitoba right now. We’re supposed to leave on vacation tomorrow and we’re just hoping we can get there! If not I may have to make myself busy in the kitchen too 🙂 I hope you have a great rest of the week! Welcome to Canada! I am making these cookies right now (I live in Vancouver, BC) and it’s clear and cold outside and may snow tonight. Our snow only lasts for a couple of days but I, too, like the smell of baking cookies! I realized that I forgot to buy caramels……. so, having raised kids that love Peanut butter and jam sandwiches, I put jam in the center of the cookie instead of a caramel…….they are DELICIOUS!!!!!! Merry Christmas and happy baking!!! 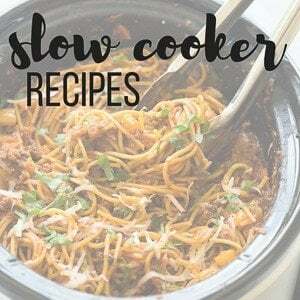 These look amazing, but you see, I’m on a crunch to get stuff done, but I want to make goodies for the hubs to take to work, would this work with storebought peanut butter cookie dough or is it worth the extra effort to make the cookie from scratch? His guys will devour them in a instant anyway and will likely never taste the cookie. If I had time, it’d be different, but just asking to decrease my work time so I can move on to the other zillion things on my list! Thanks Ashley! It’s worth trying this time around, then when I have more time I’ll do them from scratch. Thanks a million and Merry Christmas!! I’d love to hear how it works out! Would these be ok to freeze? They look delicious! Love the peanut butter cookie base! I need to add these to my baking list! I slack on christmas cookies too and this year I have to change that. These PB turtle cookies are the best place to start!! Oh my goodness…these look absolutely unreal! I love peanut butter cookies but you’ve taken them to a whole new level! I’m game for anything peanut butter and turtle! Lovely photos as always Ashley! Whaaaat – these are AWESOME. They have everything I’d ever want in a cookie, EVER. Or any dessert, for that matter! I love thumbprints. 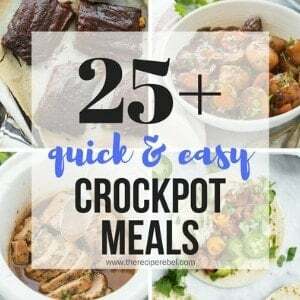 They’re some of my fave to make! So many fun possibilities! How in the WORLD are you on a diet with these beauties lying around Ashley? They are gorgeous! And I love love love that caramel centre! Pinned! Haha! See the thing is, these were devoured weeks ago 😉 Thanks Jess! Guuurl, you don’t need to post a ton of cookies for the holiday season because you posted these – and these bad boys look like the end all BE ALL of holiday cookies!! Seriously, I adore a good thumbprint cookie, but these blow the traditional ones right outta the dang water! Peanut butter and caramel? I can’t. Well, I can. And I will!! But you know what I mean. 😉 LOVE THESE! Pinned! Cheers! Thumbprint cookies are some of my favorite cookies to make! I’m absolutely crazy over these with peanut butter, caramel, chocolate, and nuts!!! They’d be perfect for gift giving this year. I have like one new cookie post… I’m right there with you!!! Love this twist on a thumbprint because can we ever have enough peanut butter in our life?! Hi Ashley! I love everything about these cookies! I’ve already sent one package to a friend in Florida…a little early but she doesn’t mind! I believe these will be in several baskets for delivery to friends here! I feel like I dropped the ball when it comes to Christmas cookies, too! I was just telling my husband last night that I only have one cookie recipe to share coming up. I think your thumb print cookies make up for the lack of cookies by their deliciousness! I’ve never had a peanut butter version before, so I’m loving this! Looks perfect for the dessert table! Yes! I had to quickly make some to make up for that fact. Lol. Luckily, I think these will satisfy all of my cookie cravings!